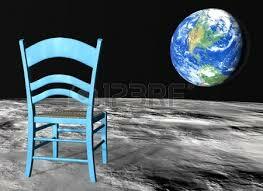 Would martians like my chairs? I’m not going to bore you with any sort of descriptive narrative here – not going to tell you about the trees, the birds, nor the grass that isn’t exactly green yet despite the fact that the calendar says its spring … not going to tell you what I see when I peer into the neighbors house, about last year’s dead herb garden, nor about the chocolate lab that might forcibly lose all his toenails if he continues to wake me up in the middle of the night by clicking and clacking his way across the downstairs wood floors … BUT. I will take a moment to complain about the perfectly ridiculously expensive outdoor dining table that’s various planks have sprouted fungus and began to rot – here’s the part where I complain: See this perfectly ridiculously expensive outdoor dining table is only two years old and it is surrounded by a number of perfectly reasonable economically priced, 10-year old, chairs – chairs that are still as solid as the first day anyone sat on them. Why does the perfectly ridiculously expensive outdoor dining table need to be replaced, chucked, torn apart for selvage, when the perfectly reasonable economically priced chairs are solid enough to make a trip to space and back … just in case that aforementioned alien ever happens by my backyard and decides he’d like to see how they’d hold up on his planet. Previous Ticky-Tacky … I’ll drink to that! Damn that over priced Table fell apart again.